Ships today if you order in the next 11 hours 59 minutes. 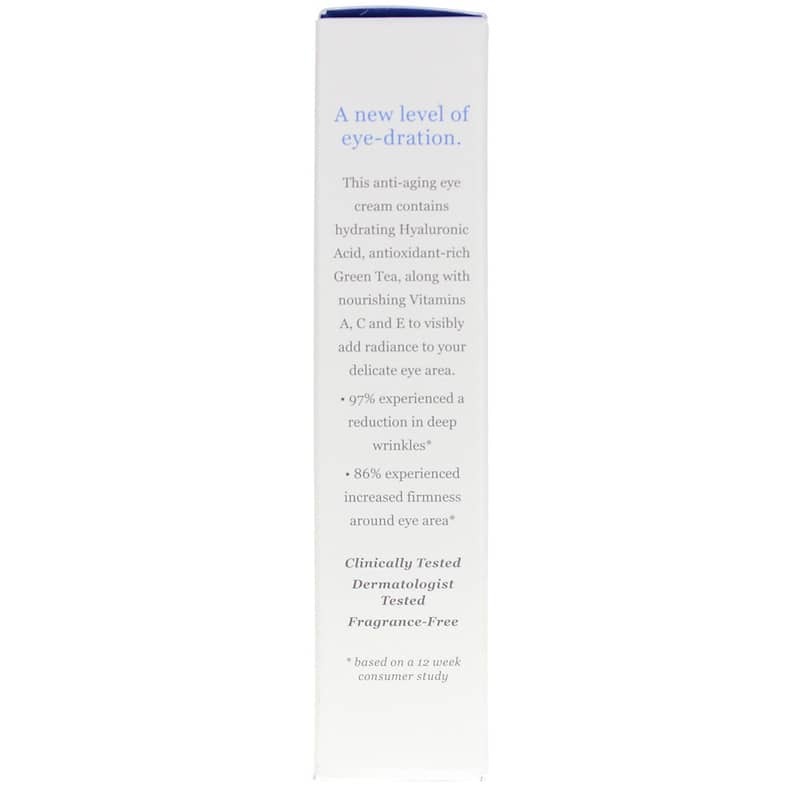 Hydrating Eye Cream with Hyaluronic Acid from Derma E is deeply hydrating and nourishing to the sensitive skin around your eyes. This blend of skin specific nutrients and antioxidants is highly helpful in reducing fine lines and wrinkles. 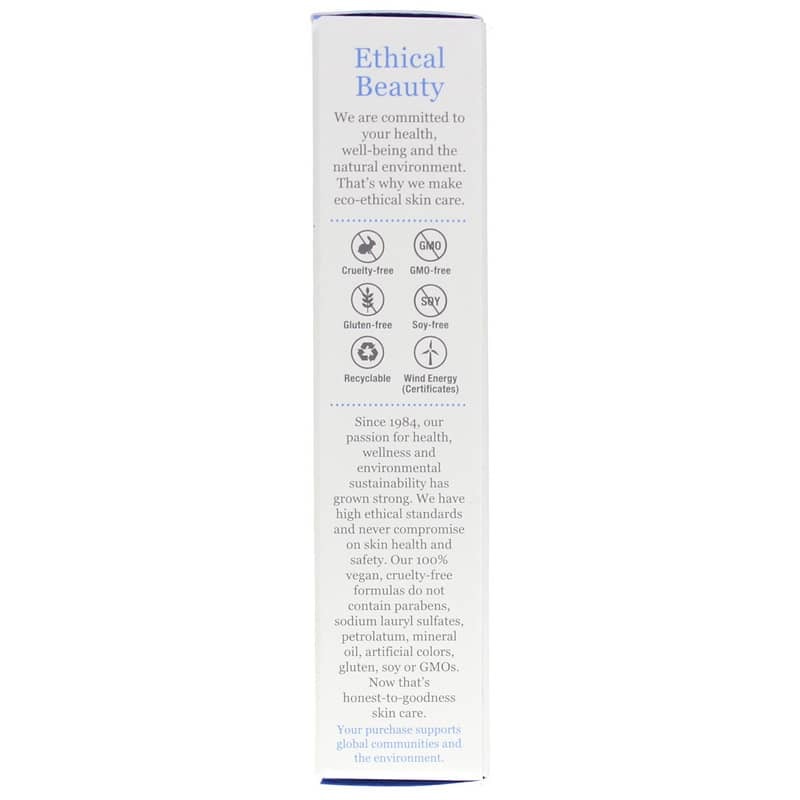 Contains NO: parabens, sodium lauryl sulfates, petrolatum, mineral oil, artificial colors, gluten, soy or GMOs. Deeply hydrate, firm and tone the delicate skin around your eyes while reducing the look of fine lines and crow's feet with Derma E's, fragrance-free eye cream. Hyaluronic Acid (HA), also known as nature's moisture magnet, has the ability to hold up to 1,000 times its weight in water, binding moisture to help soften, smooth, tone and rehydrate skin. 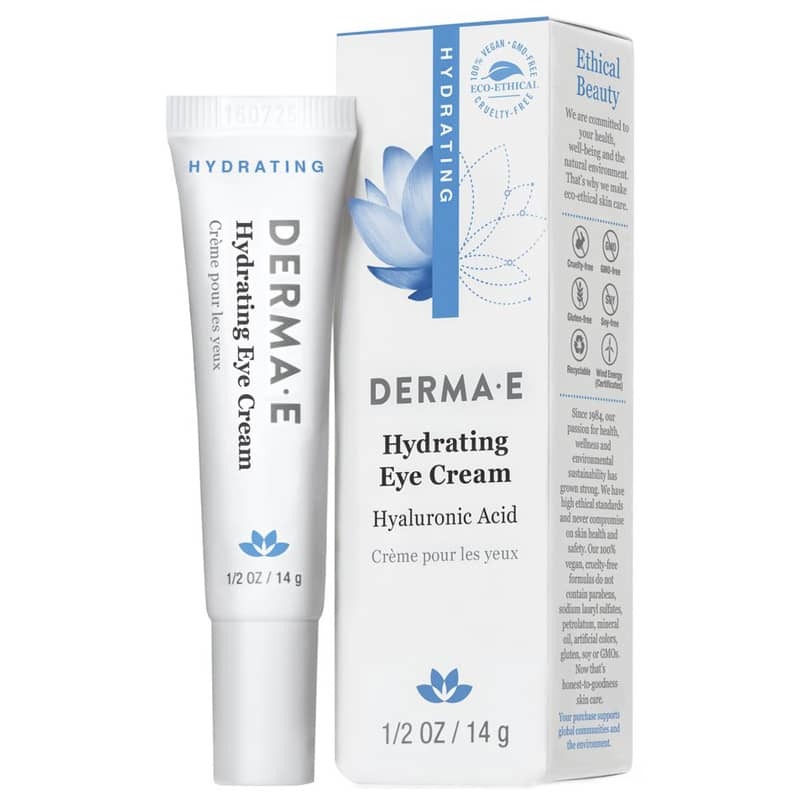 Only Derma E has blended the unmatched hydrating properties of HA with antioxidants Pycnogenol and Green Tea, moisturizing Jojoba Oil and nourishing Vitamins A, C and E into a rich, replenishing eye crème to keep eyes young and radiant looking. Purified Water (Aqua), Caprylic/Capric Triglyceride (Plant Derived), Glycerin (Vegetable Derived), Stearic Acid (Vegetable Derived), Cetyl Alcohol (Plant Derived), Glyceryl Stearate SE, Hamamelis Virginiana (Witch Hazel) Extract, Sodium Hyaluronate (Hyaluronic Acid; Actimoist Bio-1), Tocopheryl Acetate (Vitamin E), Retinyl Palmitate (Vitamin A), Ascorbyl Palmitate (Vitamin C-Ester), Pinus Pinaster (Pycnogenol) Bark Extract, Panthenol (Provitamin B5), Organic Camellia Sinensis (Green Tea) Leaf Extract*, Organic Aloe Barbadensis Gel Extract*, Organic Simmondsia Chinensis (Jojoba) Seed Oil*, Xanthan Gum, Allantoin, Dimethicone, Titanium Dioxide, Potassium Sorbate, Phenoxyethanol, Ethylhexylglycerin. 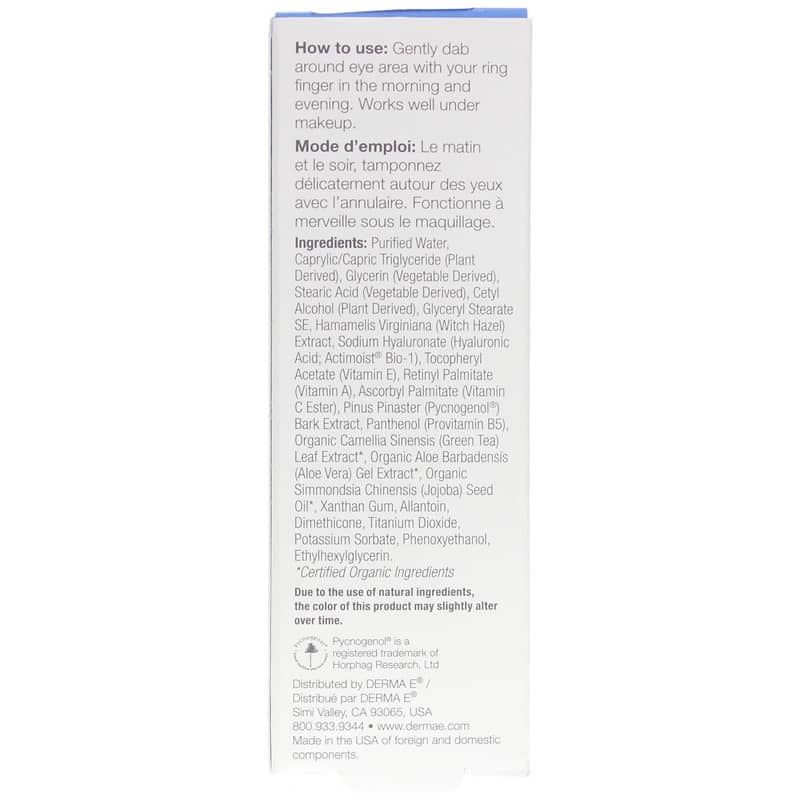 Contains NO: parabens, sodium lauryl sulfates, petrolatum, mineral oil, artificial colors, gluten, soy or GMOs. Vegan.